My fav! Bobber fishing for Salmon! Bill is off to share an adventure on the river. 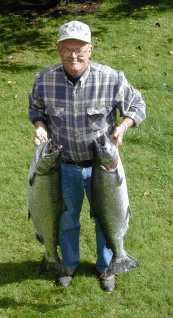 He donated a trip to the Northwest Steelheaders Annual Banquet and this is the chosen day. I think I am getting better! Captain J and his wife invited me to fish the Nehalem. (Actually, I kind of begged on board last night in a moment of post fishing-induced wellness!) I walked down to the river and threw a bobber and worm around. Nada. I wanted to go with them so badly, but now I feel kinda weakly. Tis the season... It always seems as if Fall brings tons of doctor appointments for Andrew, David and I, from heart tests to dental cleanings to vision screening to...? Tillamook bay has been a little spotty, as has been the Nehalem. It was good up until the last weekend when it slowed somewhat. I think it is starting to pick back up again, and should, as the tides improve and that big full moon starts to grow smaller. I am looking forward to this weeks Fall Premier of NBC's ER. It includes a story line about a patient who has Marfan Syndrome and is misdiagnosed. Unfortunately, the patient dies. I wish they would have saved him! Oops, did I give away the story line? Off to take David to jazz band, and home to a warm place on the Kilchis River. Peace and quiet in the canyon on the river. I still have time to change my mind, drop all and go with Captain J and Evelyn. When I first moved to the Kilchis Canyon, I stood comparatively small amongst the tall, hovering trees of the canyon. The acre of mowed lawn under my bare feet gave way to thoughts of fly casting practice. It felt peaceful and park-like. Quiet, free, and safe. I saw myself twirling in a full skirt, face to the sky, or throwing Frisbees with my kids. "This land is my land, this land is your land! From California..."
I was alone, in control, away from the dangers of the city! Set here in peaceful nature, the tall and secure house stands still and protected. It has taken me two years to realize that this is not my land. This land is not your land. This land belongs to those that have owned it for centuries. The long inhabitants. The generations of wild animal creatures who have roamed it, hunted it, and protected it. I have brought strangers into it. Cats, dogs, chickens and rabbits. They know not the ways of predators. They are unarmed and innocent to the fierce competition that exists amongst the locals. "Oh my gosh!!! The chickens, Bill!" Awful noises rose from the border of our manicured lawn that leads directly to the thick brambles and dense forest they call "home". The muting of the television gave way to screeches, growls, and the awful nervous squawking of hens at risk. I grabbed the spotlight and Bill ran down to the chicken coup, gun in hand. All was well, but the night was young. Bill set the live trap. I woke again to the sound of a coyote, and then later to the screeching of a bobcat. Just three days ago, a bobcat was sunning itself in our field. Totally bold and unafraid as we looked on. Our chickens were loose that day, and his interest was piqued. The wild ones were alert and hunting last night, coming down from the hills, perhaps in search of water in these dry fall days. Perhaps their search for water would lead them to our dinner menu. Cats, chickens, and rabbits, oh boy! I couldn't get back to sleep. I felt threatened, after losing two pet cats to these predators. Terrorists, these creatures. Am I safe here? I thought about packing my beloved pets up and moving to the city. To the city, where they are safe. I thought about living in a high rise apartment, locking my doors, and never letting my pets out the door. Just about then, the recurrent and horrible vision of the twin towers popped into my head. Bill just checked the live trap. It has been bent and broken in the past, perhaps by catching a bobcat that didn't particularly care to stay there. It now contains one raccoon that will be relocated soon. When I first moved here, I was protective against Bill's desire to trap innocent animals. Innocent? Not! I learned soon. If it weren't illegal, I'd take that raccoon to the city. It's been absolutely gorgeous here on the coast for as long as I can remember. The chill in the air in the evening, the floating bathrooms at the ghost hole, and the bumper boats on Tillamook Bay are the only hints that fall is here. I had two hours before leaving for a doctors appointment in Seaside. I called Pete Morris, who I knew to be on the bay. "Oh Pete! I have a fever, I don't feel well, can you help?" Pete could help. It wasn't a big chinook, but hey, it wiggled, and I needed wiggles! It was great, the bite, the feel of it's weight against my beautiful GL3. I was holding the rod when it went off, and I love that! Sometimes I wonder if it is worth fishing when the seaweed is so darn thick. Every two minutes you feel that squishy pull of weeds as you bounce bottom, and reel in to clean it off. I mean, just how much fishing time am I getting in? How much real presentation? That is what I was doing when it went off. Every few minutes I had to pull up after feeling that pull of green slime. "There he is!" I said, and sure enough, it was a bright buck for Jen that worked as well or better than three courses of antibiotics. Pete dropped me at the dock, I weakly ran, half dragging the catch to the car. I slipped it into my stowed fish bag, grabbed the cell phone and called to meet Bill at a half way point. ("Hi hon, can you please meet me half way and take care of this fish? I'm late!") I drove double speed to Seaside for a cat scan. being sick for a month is not fun. The only medicine that helps is fishing. Funny, on Thursday there was a really hot bite between 10 and 11 A.M., so I talked Bill into hitting it the next day from 8:30 to 2:00, and wouldn't you know? It didn't happen. Why can't these fish be consistent? All in all, I do know that fishing makes me feel better. Oh mighty salmonid doctor, heal me! It would have put me over the edge. As I fell asleep last night, terrible memories took me back to a time when I had a little puppy named Bunjo who became ill. I had so much love for that little guy. I had him for four weeks before it hit. I took him to the vet when he started vomiting. The doctor called it right away. Parvo virus. The vet didn't give me much hope, but hope I had. Hope and the endurance of my early twenties. My lights stayed on for three days and three nights. I held him, trying to force feed water to him. Spent the days at the vets, getting intravenous fluids into him and the nights holding him on the couch, or papering the floor with fresh newspaper to aid in the messes. I have always brought home and nursed stray animals. God help me forget the time I tried to give mouth to mouth to a sick goat kid. On the fourth night of nursing this sick pup, fatigue gave in. Bunjo was in a box by my bed, enabling one of my hands to be able to wander down to pat him as I restlessly slept with the lights on. I'll never forget waking up. My hand immediately traveled down to his resting place. I was met by the cold, damp body of a pup who just couldn't take it anymore. I was devastated. Last night I fell asleep at 7:00. Absolutely exhausted, sleep came easy. Bill woke me at 9:30 in a panic. "It's the kitty! He can't breathe!" That very day I had finally named the kitty "Moo". He is colored quite like the dairy cows in Tillamook. Moo couldn't breathe. He lay listlessly in my hands. A terrible wheezing came from his open mouth. "I'll call the vet" Bill said. We followed the dark country roads into town with that little kitty, at 10:00 at night. The vet didn't give Moo much hope. I can't remember what the name of what he said he had, but it causes blisters in his mouth and throat, and a type of pneumonia. "It comes on suddenly" He gravely told us. "I'd give him about a 10% chance of making it through the next four hours." He gave him a shot to make him more comfortable. So, with sadness and a near death certificate, Bill and I drove home silently. A restless, feverish, convulsing little body was wrapped in between my pajamas and robe. We made him a basket, filled with hot water bottles and towels. I said a prayer for the world, for my family, but mostly for Moo. I finally fell into a deep, sleep, my heart heavy. At four this morning, I woke to a purring sound, a pleasant alternative to an alarm clock. A warm furry body of Moo rested against my cheek. I couldn't believe my half sleep until I turned on the light. Moo is now busily lapping up a bowl of warm milk, acting like, "Isn't the world grand, and everything in it?" Thank God that my awful memory wasn't replayed. I don't know about the world, but I think Moo will be fine. A happy phone call to the vet is in order. 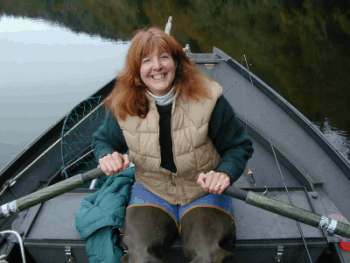 Way back in the summer, I told you that if I accidentally mortally hooked a cutthroat trout, I would have to quit targeting cutts in the upper hole. I did it. I hooked a small cutt that bled profusely. I feel awful, and now I can't fish for cutts there any more. It wasn't my fault! I was fishing barbless! It just hooked him in the gills and he was gushing! I tried to revive him, but I don't think it was successful. In the evening, I walk up to the upper hole, and fish with bobber and bait. I do this for many reasons, the least of which is to hook and kill fish. I do it because I need my time with the river. It clears my mind, brings me peace, and I assume it works better than Prozac for calming the nerves in this crazy time in our world. I stare at the bobber, through the bobber at the fall leaves, at the lush forest, at the tall second growth Douglas Firs. So far, I have caught several cutts, a summer steelie and a nice jack. All were successfully released, even though I could have kept the steelie and the jack. My freezer is full of fish, and I like to dream about recatching them! I had a very stale period for the last week. Nothing would bite anything I put under a bobber. I tried eggs, I tried shrimp, I tried worms. What I hadn't taken the time to try on this particular fishery, was Marie's Shrimp Scent. When I go out back, I don't take the time to fill my tackle bag properly, as when I am leaving the house to fish elsewhere. I just throw some minimal tackle in a bag and walk. Two nights ago, I grabbed some nightcrawlers out of the bait fridge. I headed out to the river as normal. You know me, throw some hooks in my pocket, and go! I fished the nightcrawlers, and let the bobber slowly pass through all the fishiest spots several times. Not a movement, not a flash, no sign of life existed in this deep, clear pool. I reached in my tackle bag for an extra split shot, thinking that perhaps I wasn't drifting straight down. Oops! I realized that I had grabbed my chinook bobber fishing bag instead of my cutt bag! Hidden deep inside, and peeking at me, was a bottle of Marie's shrimp scent. Heck with the split shot! Let's try this! My bottle of shrimp scent is retro fitted with a needle top. I injected just a touch inside the threaded worm, and let a little drip down the sides. OHMYGOSH! A flash! A takedown! A BIG CUTT! I landed a very fat cutthroat trout! It was beautifully spotted with deep black spots, the characteristic pink/peach shading on it's gills. I quickly measured it at 17 1/2 inches, and successfully returned it to it's home. I caught and released several more smaller fish with Marie's shrimp scent and worms, before I did the dirty deed. The last one I caught, perhaps 8 inches, (and a beauty), took the hook wrong. O.K., so he wouldn't have died if I hadn't of targeted it, but darnit, he took the hook wrong! Now with the rain coming, I can look forward to the upper migration of the mightiest of salmonids that visit my home. The chinook salmon. I can hook these and bring them home to the dinner table. And that, my friends, is precisely what I plan on doing. I have to decide, though when to have an intensive eye surgery I found out I have to have yesterday. Which fishing do I want to miss? NONE! Thinking about upcoming eye surgery, and remembering my last one... It bugs me, therefore, I write. I can remember the good and I can remember the bad. The good of my eye surgery, four years ago when I lost my right eye, was the motel I stayed in. I was told I had to have an adult with me post surgery. I chose Andrew, my 10 year old son. The next morning, clad in a bulky eye patch, Andrew and I took Max downtown, raced to the top of high buildings in dual elevators, ate chicken with extremely hot sauce in the downtown fountain park, and visited an Irish festival. The good was weeks after, when I realized I could see things I had never seen before, patterns in the wall paper would find me staring at the wall, ooh-ing and ah-ing. Moo, my new kitten, just died in my arms. I can't finish my article. He was really tired yesterday, and not well. This is a real test in my life. I will be O.K.. I will be O.K. I will be O.K. I'll be fine, it's just hard. I can't believe I lost Ginger 8 weeks ago or so, and now this little kitty, that was the cure for the sadness has gone too. Add to that, Chickie baby, Hershey, and Simba, and that's 5 pets in two years, lost. It seems a little like overload, with all that is going on, but I suppose I am just looking at things with a negative perspective. I'm just going to try and look at everything a little lighter, a little brighter, and smile still. Sad things happen, but it's what you make of them. We gave joy to that sick little kitten for the short time he was here, and he gave us joy also. I'm going to get another kitty as soon as my vet says that it is O.K., that there aren't catchable germs around here. I may need to bleach the area in which he spent time. The boys are sad, and unusually quiet. Moo wasn't healthy when we got him.We like to rescue wounded animals and make them well. Sometimes you do your best, and your best just isn't enough. This time I'm going to surprise them with a healthy little kitten. I'll save a sick one next time around. Bye, sweet kitty, and thanks for the smiles. So, I am facing a couple surgeries, I have lost quite a few pets in the past, and I haven't been feeling well. I am sad for the tragedy of the world. But, I have a happy family, safe and secure in the Kilchis Canyon. Thank God! I caught a beautiful Fall Salmon that made me smile! So did Bill! Thank God! I have a beautiful lab that smiles at me with her wagging tail no matter what mood I am in! I also have a warm, purring cat named Jack that sleeps in my lap. Thank God! The other day I drove up to get the mail. The first real wind of fall blew as I reached the summit. Huge maple leaves shouting colors of deep red and orange swirled around my car. As they landed on the pavement, they danced and chased each other around in circles like children on a playground! I stopped to get out and watch. I can see! Thank God! I don't have to travel to church today. I get to stay here and go to the local church! Thank God! I really have so many things to be thankful for. I have decided that our family should not turn on the news on TV until 5 o clock. This way, we can concentrate on our lives, and not be bombarded with fear and trembling in these troubled times. (I do find myself cheating and peeking at times...) But for the most part, I want to spend time laughing, loving, being peaceful. I have a river out back of our home. I find myself trekking down to listen to it's song, and to soak up it's beauty more often than I had. I cast my line into the depths. It is a direct connection to it's strength, it's current, it's clean and innocent flow. It is purifying to my soul. Calming to my nerves. There I find a way to realize that my troubles are so few, compared to so many. The house is quiet, the boys are with their Dad, and Bill is in Portland. I woke to whispers of fog mixed in amongst the tree tops on the hillside, glowing hot pink as the sun came up. What could be better? Ahhhh. First a call to the doc to make sure I have the day off. Tests? Lines of doctors oohing and ahhing at the girl with Marfan Syndrome... If they don't want to poke at me, it's off to the Trask to fish with a couple of friends that are in town. Bobber fishing. My passion. Last night, I wandered to the river, bobber and shrimp as ammo, and caught perhaps the last cutthroat of the year. I know, I said I wasn't going to fish it, but I had to! I caught and released a beautiful fat cutt about 15 inches or so. It was hooked just right, in the corner of the lip, just as a fly usually sets. I released him, fished a bit longer and put my gear away. Then it was off to the depths of the woods to search for chanterelles close to home. I didn't find any. I did nearly get lost, but I enjoyed every minute of being lost, finding tiny little frogs in the moss, feeling protected by the tall, moss covered rain forest. I enjoyed hearing nothing but quiet. The ultimate quiet. The wild. Home to a pint (single serve, don't you know!) of Tom and Jerry's pistachio and chocolate ice cream. They won't let me fish! No one! On the 15th, I had the day to myself, or planned it that way. I did my usual web work in absolute peace, the boys gone, Bill in Portland, the house quiet. All of the sudden, I remembered, Bev and Dot are bank fishing on the Trask! I get to go bobber fishing! So, I finished rigging my bobber rod, tied the bobber-stop-of-all-bobber-stops out of some sturgeon dacron leader, and put everything neatly in the car. Ooops! Forgot the eggs. Into the house to get eggs. "Mom?" It was David, in a pathetic little voice. "I feel awful". "Oh honey... I'll come pick you up". I said sweetly. What could I do? I am the Mom. I went to get him. Ran a couple errands with him in the car. Went to get him a little bit of lunch which he ate two bites of and put back in the bag. He reclined his seat, looking flushed. He's really sick! "I am still going fishing, darnit". I was set on it. David is now 13. He can do for himself for two hours. Out the door... almost. The phone rings. "Mom?" It was Andrew. "I feel awful." WHAT?!?!" I fumed! WHAT?!? You feel what??? "I'll come pick you up, honey..." I finally breathed through my frustration. They are dropping like flies. It is 15 miles, round trip, to school. It was noon by then. Perhaps I can still go? But no! I get in the car, and as soon as my cell phone was in working area, it went off. "Jennie, this is client 'abc'. We need a change on our web page to reflect our current special, as soon as possible." I picked up Andrew, started to drive home, thinking perhaps, I could get a few casts still in with my friends. Almost home, and I see Bev and Dot's car just leaving my home. They had finished fishing. They came in for a visit, gave me the neatest lure, that Dot had created. (It's SO funny, lookee here!) I just can't wait to secretly tie it on and hook up with Bill wondering what the heck is the hot spinner I'm fishing. So, yesterday, I get up, Bill's thinking, "Let's fish the Nehalem". At least, that is what he had said the night before. He got up yesterday and changed his mind. I had a hissy fit. So I packed up my gear, and went for a drive. The Kilchis... tide's out, too low. The Trask, tides out, too low. The car dealership. Gee, that's a nice Chevy Blazer.... I think I'll take it! It has a tow package! Oh my gosh! Look at that boat for sale! It looks just like one that I could handle! Think I'll take it! Dream land... Independent Jennie fishing! Instead, I went to the grocery store, to fill up on veggies and make my kids well. I don't fish anymore. I wake up at 4:30 in the morning and write about my wish to fish. That's what I do. Maybe the kids will be well today. Maybe Bill will wake up and want to fish today. Maybe I need to finally learn the bank fishing areas around here, so that I can be more independent. I'm going to run away and fish forever. Oh boy, oh boy, oh boy.... I can feel their great migration coming! Sunday Rain becoming likely. Highs near 55. Monday and Tuesday Windy with rain. Lows 45 to 50. Highs in the upper 50s. Wednesday and Thursday Rain at times. Lows near 45. Highs in the upper 50s. I love forecasts such as these! Please make it come true! I have heard it before, and then it doesn't happen. This time... Oh please! This time, let the rivers rise, the winds blow, and the salmon arrive! I think I can smell it in the air! Yes, it's going to happen! For today, it's Memaloose in the sunshine, with a pretty red and white spinner, and a slack bite, and the fight of a lifetime, with a 70 pounder! I may live in dreams and illusions, but never give up hope! Summer is fading. All around me, signs point to the migration of salmon up the Kilchis River. This is the parade of events that I love. The cutthroat, the chums, the chinook, the steelhead. Last night Bill and I sat at the table and ate the last of the sugar snap peas that we collected off of the vines. Stir fried with one of many summer squash that are now becoming abundant in our overgrown garden. We added plenty of Bill's home grown garlic to the mix and sliced some tomatoes, which are late, and just now turning red. The salmon are coming. The salmon are coming. We are gathering the tomatoes off the vine at the first hint of color, and setting them in the window to ripen. I worry that if we leave them, the first frost will take them from us. Last night we had a low of 42. Still safe! Things are about to rapidly change around here. The grass needs to be mowed one more time. It never did get brown this year, despite the drought and any watering help from us. The rain is said to set in today. From then on, we will see the summer skin washed off of the rocks that frame the low levels of the summer river. Floating the lower river, I'll gaze over the side and see it mingle downstream. The face of summer slowly drifting deep in the current, and then gone, till next year. The bottom of the deepest pools contain colors of autumn. Bright oranges, reds and browns reflect off the bottom, and will be washed downstream to join the ocean blue. I have seen the leaves there along the ocean beaches, all crumpled up into bits of diluted color, and worn after their journey. I always wonder, as I walk along. Are these Kilchis river leaves? Necanicum? Wilson? Siletz? It is, in fact, my very favorite time of year. There is a fire in the woodstove, coffee on the stove. The earth is quiet and still, waiting, waiting, waiting. I drove home from town the other day on a road completely covered with fall leaves. A delightful combination of colors paved my travel. Bright oranges and reds...Mixes of big leaf maple, vine maple and alder leaves called me home. I drove slowly, taking it all in. Just as I opened the car door in my driveway, a 41 m.p.h. gust slammed me in the face. Home, it seemed, to winter. In the Pacific Northwest, seasons change in one day. Off with fall, onto winter! One day where Mother Nature rises up and cleans house. I greeted her with glee. This was an exceptionally timed season change. A change that simply washed the colors of fall into the rivers in one afternoon. Oh! If only I could clean house this way! There are still hints of fall left on the hillside. Stubborn vine maple stand out, misplaced, and brightly lit against the drab and color washed background. My routine changes accordingly. I packed away my light weight fly rod. It is time to greet the rivers with heavier equipment. "Salmon return from the sea to the freshwater breeding grounds of their birth to spawn and die. In doing so, they import ocean-derived mineral nutrients that fertilize the riparian ecosystem. The effect of this mineral import has been quantified by Helfield and Naiman for a site in southeast Alaska. Using isotopic analysis, which can identify marine-derived elements, they find that at least one-fifth of the nitrogen (N) in the needles of Sitka spruce trees and other plants near spawning sites comes from the ocean via Pacific salmon carcasses. Growth rates of trees near spawning sites were significantly higher than in reference sites. These marine subsidies to inland ecosystems are likely to decline as Pacific salmon become increasingly rare. - AMS "
The brightly colored leaves of fall that cushion the bottom of the river leads these fish to their destiny. The trees call the salmon home. I live in the trees, deep in a canyon, beside a river. Come home, salmon.... Come home. Mother Nature can change seasons in one day. 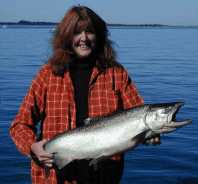 Can we help her save our salmon? I stood there, defeated, wading stick in hand. I was half way across the Kilchis River in my new hip boots. I longingly gazed toward the other side. The realization set in that I was stuck. My feet felt the strong pull of the new current. Winter is here. I have new boundaries. The river's new depth, the pull of her current simply outmatched my strength. I was going no further. I crossed here easily last week! My summer tramping grounds were now only accessible by car. My legs weakened as I gave in and trudged back to shore. After the rain, last week, I crossed right here. The forest called me to search for chanterelles. Each fallen tree I climbed over, each thicket of bramble, each clearing called me deeper and deeper into her wild, damp home. Soon, I was miles from the river. Winter... a whole new season that slows down my life, and limits my foot travel. My drive to or from town now stretches from the usual 15 minutes to an hour or longer. I take side roads that permit me to observe fall angling activities. I drive up logging roads so that I can reach the out of the way forests. I stop at the Guide Shop to have coffee, and talk with the local anglers. Along the way, trucks are parked at various boat ramps. Cars carelessly angled against the river, near pockets that are known bank angling hang outs. If I'm lucky, I see a boat taking out on the Wilson, Trask, or Kilchis. I am envious of their adventure. "How'd you do? What's in there? Have a good trip?" I slow down and gawk out the window to see if I notice ripples of salmon in the bank angling holes, fish on, or silent lines swirling in the depths. If I park and get out, I find these people welcome my presence, especially if they see I don't have a rod in hand! I finally reach home. I run from the heat of my enclosed car, through the wet grass, and into the door. I am greeted with the radiant warmth of the wood stove The smell of a roast slowly cooks in the stove. Garlic fills the air. The house is quiet, the kids are at school. I can work at my computer quietly, but if I open the window I hear it. The river. The taunting sound of a real river. Not a stream in the summer, but the wild, raucous song of raging winter. Interrupting the quiet necessary to concentrate, it calls me to put on my hip boots and go for a visit. Visions of salmon dance through my head. In the spring and summer, I have access to the whole river. I can wander for hours, up the river, down the river, and across... There are limited amounts of fish to be caught, so I am known to drop my rod and reel to follow wild animal footprints deep into the woods. The woods calls me deeper to explore new flowers, or elk trails, and soon I am far from home. No more. Winter has imposed it's boundaries on me, and I am forced to become very familiar with each and every rock that lines the bank of the river. Winter ... the end of the freedom that summer breezes bring. Gone are the gentle and forgiving limitations of low water flows and fly hatches. Coats and jackets decorate the mud room, as we proceed into the harsher limits of winter. The rewards of big salmon out my back door and the elk down from the hills replace any sadness at the seasons passing. I finally know now. There really is such a critter as a chanterelle mushroom! I was beginning to believe it was a bit like snipe hunting. Thanks to our very own Pete Morris, I was able to bring a half bucket of these treasures to our dinner table last night! It felt a bit like Easter, trudging around in knee deep forest undergrowth, searching for the golden hue of these delicate beauties. They peak out at you from under the deep needle and moss covered hills of our coastal forests. "Pete! I found one!... Pete! Here is more!" I danced through the woods as if I owned it. The more I found, the more excited I became! I wandered, head down, deeper and deeper into the forest. Time passed, as I, so absorbed in my hunt, forgot to keep an eye on where I was in relation to the road. My voice echoed into the trees. What had been foot deep salal, had become a mass of tangled brush that came well above my waist. Tangled masses of fallen trees surrounded me. "Hello?" I said softly. The trees stood quiet. The sound of distant birds was all that answered me. Those little golden frilly chanterelle mushrooms were gone too! I hadn't uncovered any in what seemed like ages. Everything around me was a mass of tangled overgrowth, and rain forest confusion. I have been lost in the forest before. It is a unique, disturbing, disorienting and exhausting feeling. I imagined the little chanterelles around me, hiding under the brush, giggling like little elves. "She can't find us! She is cutting our throats at the neck, and now she is lost in our forest! Serves her right!" Finally, I heard Pete up at the road. From point A to point B was only 100 feet, give or take. However, a 60 degree slope with waist high brush, fallen trees, and forest droppings made it the most difficult climb I've endured in a long time. "To the right or to the left?" I called to him. He directed me right, then left, as I periodically took rest breaks. It is frustrating to have "the kid in the candy store" attitude about finding these mushrooms, with a body that doesn't always want to comply. My legs buckled, I fell... My feet twisted and turned. Finally, my boots stumbled upon the gravel road. You know, walking back along the logging road, I found more chanterelles than I did, deep in the forest. I sat down, still panting, with real sweat dripping from my brow. Pete shared with me this final comment that he had read on our discussion board. "The best Chanterelles you get, are the ones people give to you." Although I can't totally agree, as overall, I had a dandy time in the woods, I do get an understanding of that concept. 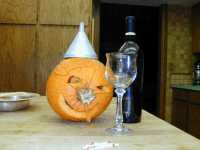 A red wine drinking pumpkin! We finally did it! Life is so busy lately, that we have put off doing the pumpkin thang. Last night, after dinner, we finally got on it! With Bill grumbling, not wanting to miss the 157th edition re run of Law and Order, I finally insisted. "It's Halloween, Bill! It is your DUTY! 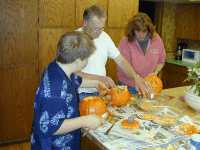 Soon enough, he was all over it, in it, instructing us on how, going to grab the candles, and separating seeds from guts for cooking or planting later. He was the biggest kid of all! Happy Halloween to all of you, and be safe out there!